“Love never gives up. Love cares more for others than for self. Love doesn’t want what it doesn’t have. Love doesn’t strut, doesn’t have a swelled head, doesn’t force itself on others, isn’t always ‘me first,’ doesn’t fly off the handle, doesn’t keep score of the sins of others, doesn’t revel when others grovel, takes pleasure in the flowering of truth, puts up with anything, trusts God always, always looks for the best, never looks back, but keeps going to the end,” 1 Corinthians 13:4-7, The Message. Whoever said it is easy to show love is dead wrong. While you may feel loved when someone spends time with you another person doesn’t feel loved unless you tell them. It is easy for you to show love in your love language because it comes so naturally but trying to show love in another person’s love language and you are likely to feel fake. 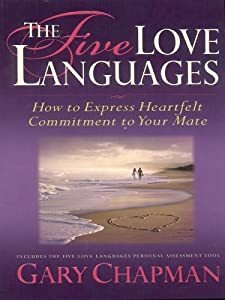 Dr. Gary Chapman in his book, “The Five Love Languages” outlines the difference between each language. To make it easier, here is a family of five with a different love language for each. Dad: Words. What you say matters so chose your words carefully. Dad feels loved when he is encouraged with words such as “You did a great job” or “I really appreciate you”. He likes to hear compliments or receive notes of encouragement. Of particular value are compliments given in the presence of others. Of particular hurt are public insults or name calling. Mom: Service. Actions speak louder than words. Mom feels loved when someone takes the time to do something for her. It can be a small task such as emptying the dishwasher, filling her car up with gas, or bringing home dinner. Of particular value are acts of service without being asked. Of particular hurt are ignored requests to compete a task. Child #1: Time. Time together is time well spent. Child #1 feels loved when someone takes time out of their day to be with them. Just being in their presence is enough, as the activity does not have to be overly engaging. For instance, sitting in the same room and being around them is satisfying. Of particular value is intentionally spending time together when life is busy such as going to the store together. Of particular hurt is not being there for games, concerts, or events. Child #2: Gifts. The well thought out gift is of greatest value. Child #2 feels loved when someone gives them a gift that reflects their personality. Small gifts are sufficient as even a pack of their favorite gum (as long as you get the flavor right) shows that you pay attention to what they like and care enough to get it. This child can tell you nearly every gift they have ever received and who gave it to them. Of particular value are surprise gifts for no reason at all. Of particular hurt are no gift or generic gifts. Child #3: Touch. A gentle touch calms the soul. Child #3 feels loved when someone gives them a hug, kiss, or gentle tap on the back. The touch does not need to be overly obvious as just a tap on the arm or holding of hands can provide a sense of love. Of particular value are a massage, good night hugs, and hello kisses. Of particular hurt is abusive touch or forced touch. By learning to speak in another person’s love language, they will feel loved by you. Since love is for the receiver, it is far more important to speak the other person’s love language then it is to keep speaking your own love language. This is not the time to compare notes as to how well someone else is speaking your love language, rather it is the time to be the example that others can follow.